This post is authored by Anna Reyner, a registered art therapist and licensed marriage and family therapist. Anna is a nationally recognized arts advocate that has conducted over 500 hands-on art workshops for learners of all abilities. 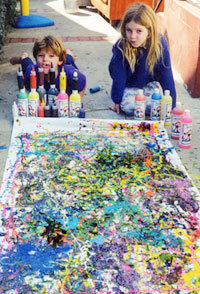 Follow Anna’s blog at Art and Creativity in Early Childhood Eduation. Visual stimulation encourages scientific thinking. It's summer again and the perfect time for outdoor activities. 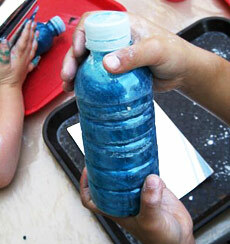 Ocean in a Bottle captivates children and leads the way to science discoveries. Simply add Colorations® Liquid Watercolor and BioColor® Shimmer Powder to plain water in any clear plastic bottle. Cap tightly and shake it up vigorously. You'll immediately discover your bottle is full of swirling "oceans" of shimmery colored waves that stay in motion long after you've stopped shaking your bottle. What's happening here? What principle of science does this exciting project illustrate? Water molecules, or H20, are invisible to the eye. If you shake up a water bottle, the water molecules begin swirling around quickly but you can't see them move because they're invisible to the eye. 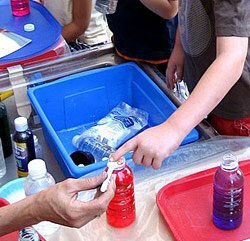 In this project you are "tagging" the water molecules with color and shimmer powder (a non-toxic micro glitter) which enables you to see the water and how it is set in motion as you shake it up. There is so much to the world around us that we cannot see without a microscope. Welcome to the fascinating world of earth science!